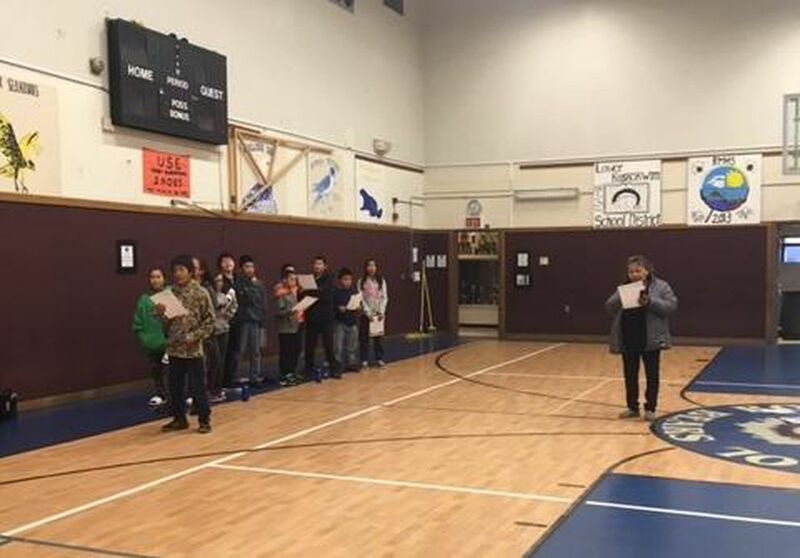 GOODNEWS BAY — At 8:35 each morning, a community member at the Rocky Mountain School leads all 64 students in kindergarten through 12th grade in the Yup'ik pledge. It is an effort to integrate the language into the school day in the absence of a teacher in Goodnews Bay. "The school board asked me where we're at on our Yup'ik teacher, and at this present time, there's nobody who has filled that position yet," Principal Sally Benedict said. "We wanted to make sure that we still had Yup'ik going on in the school. So we all went into the Yup'ik room, and we looked on our wall and saw the Pledge of Allegiance. And we thought that would be a great place to start." 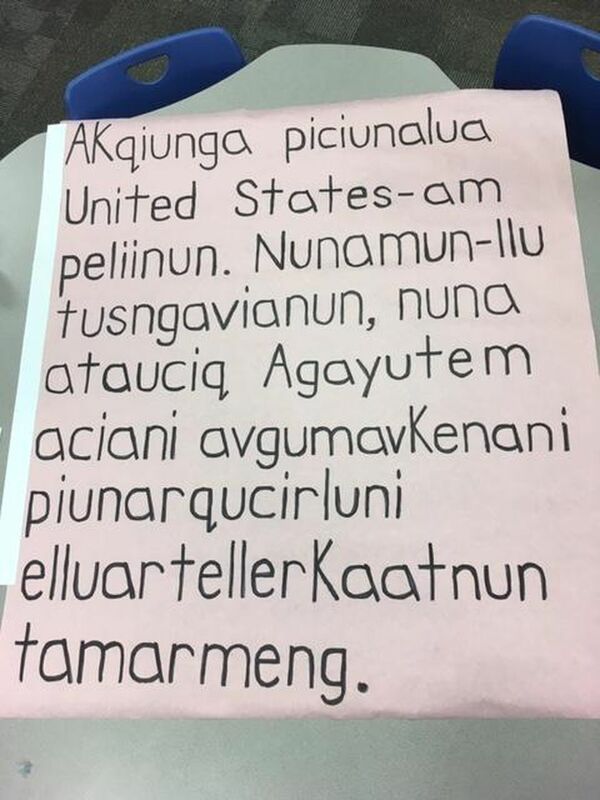 Unlike many dual-language schools in the Lower Kuskokwim School District that teach in both Yup'ik and English, the Rocky Mountain School is "English first." And finding a Yup'ik language teacher in the small community has been challenging. "You have to be able to speak, read and write Yup'ik, and you have to be able pass proficiency exams on the speaking, reading and writing, as well as being able to pass what's called a praxis exam," Benedict said. The school must hire non-regular certified instructors as associate teachers enroll in an education program. Since 2013, LKSD has required teachers who do not hold a degree to earn one by taking nine credits a year. The goal is to have more state-qualified Yup'ik teachers. The biggest hurdle to finding a teacher, Benedict said, is that the position is part-time. "It's two hours, four days a week. It is not a full-time job. So, it's super hard to get somebody," she explained. To fill the curricular void, the school is looking for a traditional cultural specialist for next semester. Applicants still need to pass a proficiency exam in Yup'ik, but they do not have to take college classes. The teaching position will remain open in hopes of attracting an instructor willing to become a certified teacher. For now, the students at Rocky Mountain School will learn the Yup'ik Pledge of Allegiance line by line. This article was originally published at KDLG.org and is republished here with permission.